Future Millionaires - How to Raise One of Those? Today we celebrate ‘Be a Millionaire Day’! The origins of this day may be unknown, but the day honors the desire to enjoy the freedom and power associated with being financially secure. We all want to raise our children to be self-sustaining and happy people and give them a chance at a life we didn’t have. We teach them how to save money, how to make the right decision, how to be a decent people etc. but wouldn’t it be nice if we could teach them how to be a future millionaire? Of course that the most important thing is to raise a happy child, but if it’s possible, why wouldn’t we do the best we can to set up their minds to become future millionaire. 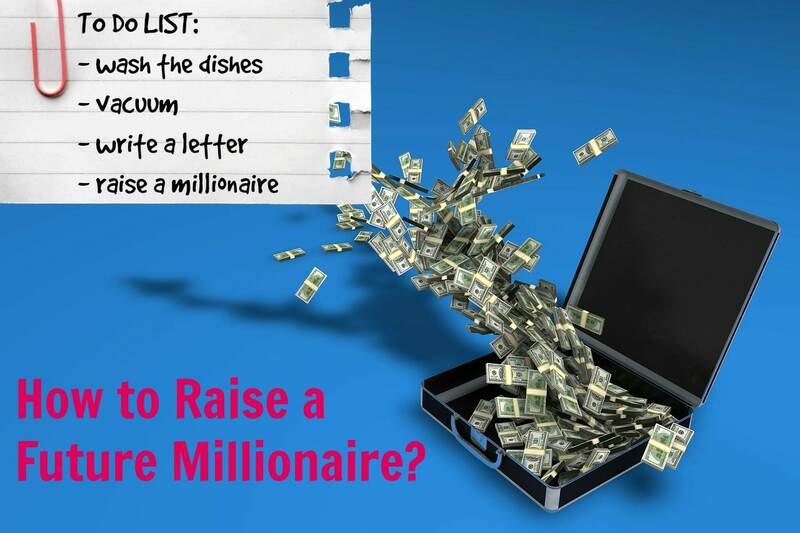 Here are some ideas on how to raise a future millionaire! Future millionaire is a person who think big and trying hard to accomplish things that everyone else says are impossible. Henry Ford wanted to bring cars to the middle-class people and he created one of the biggest businesses of his time. Thomas Edison dreamed of using electricity to light cities. Dream big! If you look at all the people who are grossing a million or more in salary per year, chances are you will find people who have taken something they love and built an empire. Who knows, your son’s fascination with crafting guitars can turn into a multi-million dollar business. Or your daughter’s love for designing clothes could set her up for life. Maybe they both are fond of writing stories which can help them make some money on assignment writing. Take away the mystery of the steps to attain this and they will be well on their way. Conventional education will bring about conventional minds. Let your children explore the world. Expanding the borders will expand their minds; allow ideas to come with new opportunities. It’s one thing to send them to a good school or make them get good grades but it’s another thing to have them really understand it. A trip to Africa to see lions will teach them about wildlife and could very well turn into a conservation project as well as other opportunities that will no doubt net profits. I believe that traveling through the world should be the best education for everybody. It’s only when you see the big picture you will be able to fully understand how everything ties together. There is no doubt you have to love what you do to be successful at it. Teach your kids that working doesn’t have to be a chore. If Bill Gates hated what he did, he wouldn’t have been one of the richest people in the world. Teach them that if they want something in life they need to work for it. Teach them the difference between working hard and working smart. Bill Gates began programming at least a few hours a day every day when he was around 12 years old. Warren Buffett began with paper routes and vending machines when he was just big enough to ride a bike. Carlos Slim’s dad started him out running the family’s businesses around 14 years old. By the time he was 30, he was already a multi-millionaire. Zuckerberg has a similar story. Bezos has a similar story. Elon Musk…. you get it. When Elon Musk was in college, he tried to live on $1 a day. All the Rockefeller children had to keep accounts of their daily spending. Many people don’t teach their kids the value of money, and even worse, some instill even negative habits and negative views of money in their kids! The combination of thrift and hard work at an early age is what separates the wealthy from those who have to borrow money. Make sure you know all these things before you try to teach them to become a future millionaire. Before you can teach them how to be rich, you must know how to get rich. Read books about investing and concepts about finance such as profit, asset, liability, equity, coupon, cost of capital, etc. You don’t have to become the next Warren Buffett, but you should be familiar with some basics. No matter what kind of life we had, we can teach our kids to have a better one. Showing them how to succeed is the one gift we can give them that they will cherish for a lifetime. Becoming a future millionaire isn’t a difficult task if you know what to do. Well, they don’t even need to become a future millionaire, but these steps will help them to succeed (and maybe even become a future millionaire! What a brilliant idea! Love this post!!! Marina, you always gives best advice, my dad is used to say dream sky you can reach somewhere. Education is real wealth. I love the quote from your dad!! He said that perfectly! Loved this Marina! I agree – we should invest more in education! These are all great things to keep in mind. I love your tips! Simple truths from childhood will stay with you forever. Fabulous! Having raised Two Current successful Entrepreneurs i say “right on!” Visiting you this week from Meet Up Monday. Feel free to pop over and visit back. I love the idea of teaching the value of money. That’s something we’re struggling with, for sure. Our son gets pretty much everything he wants from Grandma and Grandpa, so that is quite the stumbling block to teaching the value of a dollar. All important life lessons. We all want what’s best for our kids, but why not teach them to be financially secure too. Awesome ideas. Great tips! This is something I am definitely working on with my children, but I’m sure I could do much better. All three kids own their own stock, and we make sure that they keep up with it. wow so powerful! what great tips here and I wish I had seen them when my kids were young and my parents had seen them when I was young! I will be sharing this forward though with the grands! Thanks for sharing with us at Snickerdoodle! Great post! I love these tips, and love that you point out that your child’s interest could really be the thing that gives them a great career later in life. I think it’s important for us as parents to recognize our child’s interests and talents and then help them find ways to gain knowledge and competency in that field. Coupled with a solid understanding of how money works, they can go far! Good points to share. Thank you for joining the Small victories linkup. Please join again. Pinned to the group board. I love this! Such great tips, shoot, even for an adult!